Editor’s Note: With Roger Conrad out of the office dealing with a personal matter, we’ve elected to run an updated excerpt from Canada’s Midstream Marvels, a piece that he penned for Energy & Income Advisor. Roger will return to work next week. Nevertheless, depressed energy prices can curtail producers’ development plans, limiting volume growth on existing assets and demand for new capacity. In the worst-case scenario, cash-strapped customers could default on their contracts. Given the importance of midstream infrastructure to improving producers’ oil price realizations, governments in Canada’s main energy-producing provinces of Alberta and Saskatchewan have proved supportive of the industry–a salutary situation is unlikely to change anytime soon. The Conservative majority at the federal level is similarly disposed. In fact, Prime Minister Stephen Harper has been a consistent champion of TransCanada Corp’s (TSX: TRP, NYSE: TRP) Keystone XL pipeline and projects to transport crude oil from producing regions to the East Coast. Unfortunately, not even the prime minister can override opposition to energy infrastructure projects in provinces controlled by other parties–British Columbia, Ontario and Quebec all spring to mind. And whenever a proposed pipeline passes through tribal lands, midstream operators must negotiate with representatives from the First Nations. In this environment, even commercially justifiable projects face the prospect of costly delays and regulatory uncertainty; companies without the underlying profitability and patience needed to navigate this process run the risk of financial ruin if they miscalculate. To be sure, Canadian midstream companies enjoy an immense opportunity set. And the best-positioned of these names stand to grow their cash flow and dividends significantly as new projects come onstream. Valuations also appear favorable in the industry, fueled in part by the Canadian dollar’s recent weakness and investors’ preference for US equities. Put another way: The 5 percent decline in the Canadian dollar’s value relative to the greenback means that US investors get more bang for their buck in Canada’s equity markets. This table highlights 14 midstream operators with significant operations in Canada. Here are the criteria we used to whittle the field to our three favorite Canadian midstream operators. Pipeline companies historically have generated extremely reliable revenue, though overbuilding and shifts in production levels and commodity prices can increase re-contracting risks. Demand for long-haul pipelines to carry natural gas from the Rockies to the East Coast, for example, has been undermined by the rapid development of gas reserves in the Marcellus Shale. Names that own and operate multiple midstream assets in multiple regions are less vulnerable to weakness in a particular operational or geographic segment. Ten of the 14 midstream companies listed in our table have earned an investment-grade credit rating from at least one major agency. With the exception of CA$10 million drawn on its CA$40 million credit facility, WestShore Terminals Investment Corp(TSX: WTE, OTC: WTSHF) has no debt outstanding. Meanwhile, Keyera Corp (TSX: KEY, OTC: KEYUF) and Parkland Fuel Corp (TSX: PKI, OTC: PKIUF) don’t have credit ratings because they haven’t issued enough debt. Only Gibson Energy (TSX: GEI, OTC: GBNXF) is rated below investment grade. However, the firm shouldn’t have trouble accessing debt capital based on the favorable yields to maturity on its outstanding issues. All 14 companies face light refinancing needs over the next few years, giving them sufficient flexibility if credit conditions tighten. Relatively low payout ratios and stable underlying businesses speak to the sustainability of this group’s dividends. And all but two of these names have hiked their payouts over the past 12 months–an impressive show of strength. Midstream operators have a sizable opportunity set in Canada. We prefer the names that have the best projects and a history of execution, as these companies will grow their cash flow and dividends at a superior rate. Although pipelines and other midstream assets usually generate relatively stable levels of fee-based revenue, some companies’ operations and contractual arrangements entail direct exposure to commodity prices. 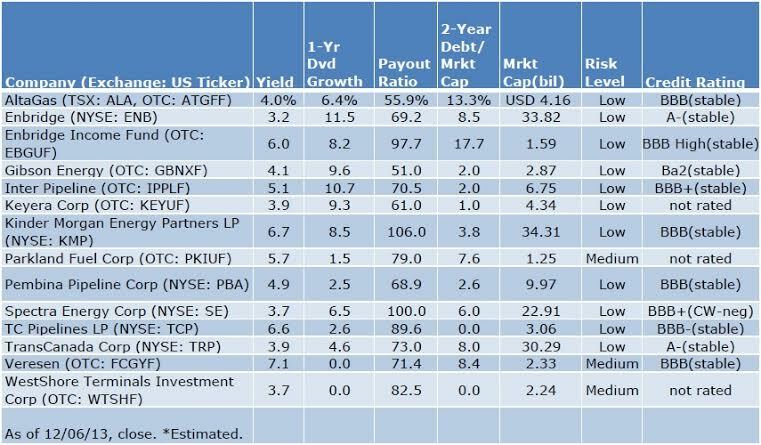 My favorite valuation tool for these names is to add the indicated yield to the company’s dividend growth rate over the past 12 months. For the highest-quality fare, this total should exceed 10 percent; riskier names should exhibit an even higher number to compensate investors appropriately. Pembina Pipeline Corp has hiked its payout by 7.7 percent since converting from an income trust to a corporation. Management has targeted annual dividend growth of 3 percent to 5 percent, with the rate dictated by project completions across its four business lines–midstream energy, conventional pipelines, oil sands/heavy oil services and gas services. The company’s first major customer was Syncrude Canada, a joint venture between seven partners that includes most of the heavyweights that operate in the oil sands. This capacity-based contract ensured that Pembina Pipeline received its allotted fees regardless of Syncrude Canada’s production volumes. In subsequent years, Pembina Pipeline’s customer base has expanded to include Canadian Natural Resources(TSX: CNQ, NYSE: CNQ) and Statoil(OSLO: STL, NYSE: STO), with which the midstream operator agreed to build the new Cornerstone Pipeline System. Meanwhile, the company’s midstream business has an impressive pipeline of growth opportunities, from NGL pipelines, fractionators and storage caverns to crude-oil and condensate logistics. And Pembina Pipeline hasn’t slowed its ambitious expansion plans since CEO Bob Michaelski announced his retirement. The midstream operator unveiled a CA$115 million expansion of its pipeline system that will deliver an additional 40,000 barrels of liquid hydrocarbons per day to the firm’s Fox Creek terminal. Meanwhile, the purchase of an industrial property formerly owned by Total (Paris: FP, NYSE: TOT) gives Pembina Pipeline an ideal site for new terminal assets. Although Pembina Pipeline Corp’s combined yield and dividend growth stands at 8.8 percent, the security of its cash flow and impressive pipeline of growth projects makes the stock a buy for conservative investors.